TV Shows Or Movies With Strong Female Action Icons Before 1975. Jason King: Stealing? Its a sure sign of frustration in a woman. 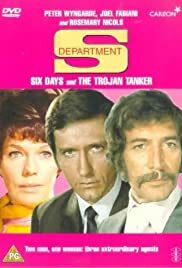 One in a series of many ITC shows during the 1960s and 70s, "Department S" was one of the highlights. Entrusted with especially baffling cases that other agencies had failed to solve, this elite department of Interpol had to find solutions to the seemingly unsolvable. Interestingly enough, and somewhat ahead of its time, the official head of he Department was black. Sir Curtis Seretse (Dennis Alaba Peters) was a high-ranking diplomat from some (never named) African country (to whom early script versions simply referred to as "the African diplomat"). A little like M in the Bond movies, he would brief Stewart Sullivan on the case at hand and then leave it to the Department to solve it. Occasionally, he would later reappear and sort of supervise. The American Stewart Sullivan (Joel Fabiani) was the field team leader. A former FBI agent, practical, pragmatic and professional, with a no-nonsense attitude, who solved cases with a stubborn insistence that there MUST be a logical explanation. He was also ready to use his fists when he had to, and to put his life on the line when it was called for. He would give chase while dodging bullets and cars bearing down on him, knock out a couple of bad guys single-handedly, and then emerge calm and cool and looking neat as ever in his three-piece-suit. For 'inspirational' input he always turned to the writer King. A bestselling novelist, Jason King (Peter Wyngarde) had a galloping imagination. He solved cases by trying to imagine what Mark Caine, the hero of his novels, would do. On the other hand, he also used the Department's cases as inspiration for his books (much to the dismay of his colleague Annabelle Hurst), so it worked both ways. Eccentric to the core, sometimes Jason's input proved very helpful, or, as Stewart remarked, "he has a nasty habit of scoring near misses". At other times, his 'theories' strayed far away from the bull's eye, or, in the words of Annabelle, "he has a nasty habit of making wild generalizations that cover just about anything!" The computer expert Annabelle Hurst (Rosemary Nicols) was the exact opposite: analytical and only interested in data, data, data, which she would then feed into her computer, "Auntie". While at times she appeared interested in little else than her work, at other times it was clear that there was some kind of romantic relationship between her and Stewart. The fact that this was never directly shown or openly stated, yet often subtly hinted at, was one of the many strong points of the show. The chemnistry between the principals was definitely there, and the teamwork was a major factor in the success of "Department S". The acting was excellent, as was most of the writing. The cases were intriguing, and the stories usually very interesting: an airliner that vanished in midair, a passenger plane that landed completely empty, a man in a spacesuit dropping dead in the midst of London, or an entire village seemingly abducted over night. Some episodes were better than others, but most of them were very good. All in all, a real highlight of an era of television that will never come back.